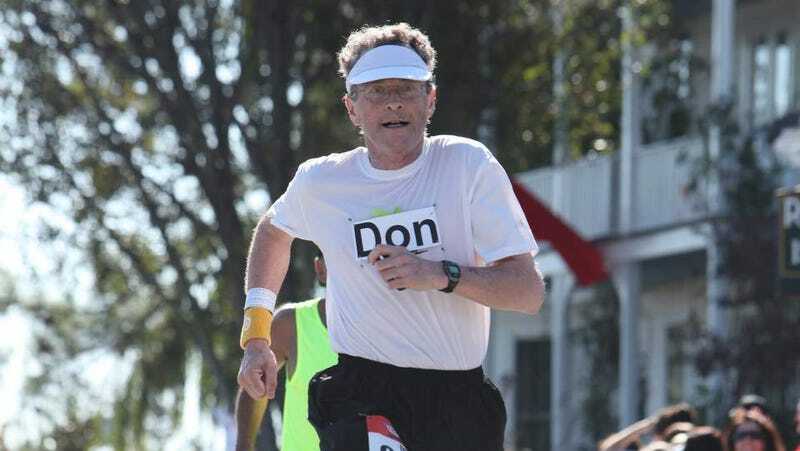 Don Wright was diagnosed with myeloma—cancer in his blood cells and bone marrow—two weeks after running his first marathon. His doctor gave him a five-year survival estimate. Eight years later he has run 60 26.2-mile races in 41 states and takes just one pill per day to keep his cancer at bay. "I feel wonderful," Wright says. He and his family run the races together: his wife and daughter run half marathons while he does the whole shebang. His only complaint is a touch of runner's knee every now and then. Wright's miracle drug is called pomalidomide, and it's still in clinical trials. It's one of several emerging therapies over the past decade that have doctors stunned and cautiously ecstatic about their effectiveness. Other drugs in this group include thalidomide (infamous for causing birth defects in the 60s) and lenalidomide, which are called immunomodulating agents. While not a cure, they could make treating cancer as relatively manageable as taking insulin for diabetes or a statin for high cholesterol. Dr. Brian Durie, the co-founder and chairman of the International Myeloma Foundation, is amazed by Wright's running stamina. "It's mind boggling, for God's sake. It's amazing." The key, he says, is to stay on the treatment, just like taking insulin regularly to keep diabetes at bay. It's a major and welcome shift from the comparatively shorter but heavy-hitting and damaging doses of chemotherapy and radiation that were the baseline treatments for myeloma 10 years ago. Most patients will take a lifetime of taking one pill per day over months of hair loss and severe nausea. "These molecules are multifunctional," Dr. Durie says. "They shut down pathways in the cancer cells and the micro-environment in the bone marrow." Nowadays, most newly-diagnosed patients try one of these novel drugs since they work so well for some people. The problem is, the treatments are unpredictable and work differently for everyone. That's why Dr. Durie and his colleagues are taking samples of patients' bone marrow and using genetic profiling to determine who will respond best to which drug. First we sequence the whole genome, then we break it up into smaller sequences about 200 nucleotides long. Then you sequence those, and you end up with literally millions of these little pieces. You line those up and compare the malignant cells with the normal cells. By comparing these super-detailed sequences of DNA, Durie hopes to one day determine who will respond best to each drug on the list of novel treatments for myeloma. "I just cruise," he says. "I coast."